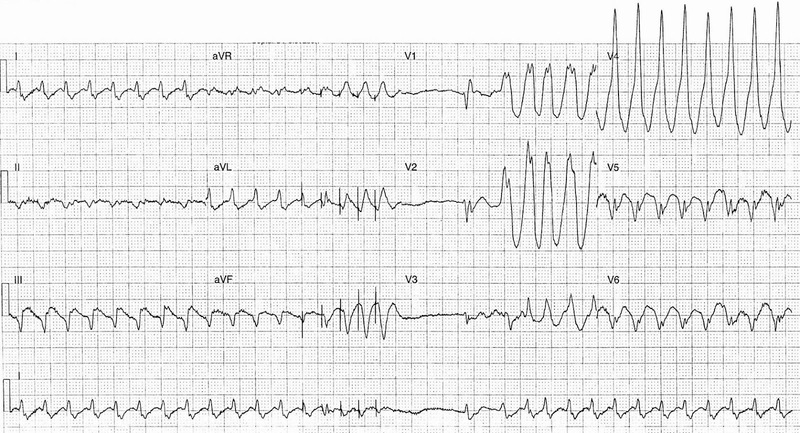 The following ECG is from a 75 yr old male with a history of cardiomyopathy. He presented to the ED following shock delivery from his AICD. This is a pacing mode found in AICDs which uses pacing delivery in an attempt to interrupt a re-entry circuit tachycardia. The advantage of ATP over shock delivery is that it prevents patient discomfort and prolonged battery life by minimizing need for shock delivery. ATP is ineffective for PMVT and VF; ATP delivery to monomorphic VT can result in acceleration and degeneration to PMVT or VF both of which will necessitate shock delivery to terminate. Further information and some more examples can be found in the articles / posts below.